CB-950 - NexSens Technology Inc. The platform integrates three 40-watt solar panels on the tower with space for up to three 28 A-Hr batteries in the data well. The stainless steel tower includes a top mounting plate for solar marine light and radar reflector. Mounts are also available for weather sensors, video cameras and other topside instruments. A 10-inch diameter by 26-inch tall data well provides a watertight housing for batteries, data loggers, sensors, and other hardware. The instrument well lid provides pass-through connections for sensors, power, venting, and more. When integrated with the optional NexSens data logger and connectorized lid, the system is truly plug-and-play. Three 6-inch pass-through ports allow for sensors to be mounted underwater while securely routing the cable. Instrument deployment pipes and custom sensor mounts attach to 6-inch NPT bottom threads. 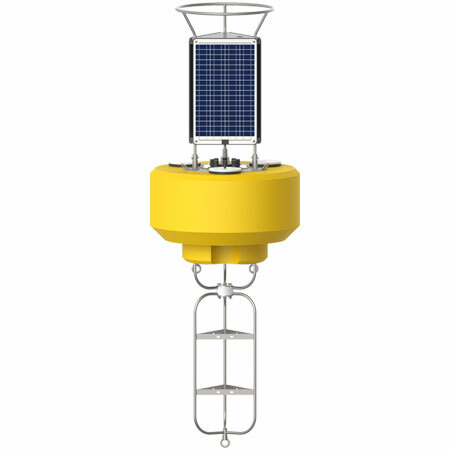 The optional solar marine light has a one to four nautical mile range and securely mounts to the buoy top plate for maximum visibility. Constructed of cross-linked polyethylene foam with a heavy polymer skin and an indestructible stainless steel frame, the CB-950 is designed for years of service.